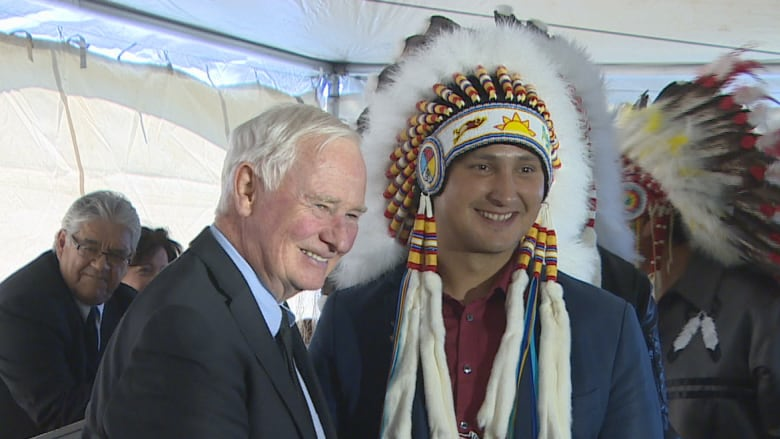 Canada's governor general and First Nations leaders were in Fort Qu'Appelle, Sask., Tuesday to attend a meeting commemorating the signing of Treaty 4 142 years ago. Treaty was first signed 142 years ago near Fort Qu'Appelle, Sask. The treaty was first signed between First Nations and the Crown in 1874. The message of the meeting was honouring the past, with an eye to the future. Gov. Gen. David Johnston spoke to a room filled with chiefs, elders and other members of the community. He said the treaties lie at the heart of the relationship between Indigenous and non-Indigenous Canadians. "Our relationship flows from this treaty, and today we have a chance to strengthen and to reinvigorate that relationship," Johnston said. Assembly of First Nations National Chief Perry Bellegarde attended the meeting as well. He said he hopes the governor general takes back information gathered by speaking to the First Nations at the meeting, and passes it along to the prime minister and cabinet members. "Nations make treaties. Treaties do not make nations," Bellegarde said. "Sovereignty, jurisdiction, peaceful co-existence, Mutual respect, sharing the land and resource wealth. You'll take something back with you and make it grow." Johnston said he's at the meeting to learn and celebrate, but also to serve as a witness to the Truth and Reconciliation Commission. "We've learned about the suffering that took place because of residential schools. And we've been inspired by the bravery of so many survivors and their descendants who are on difficult healing journeys," he said.